Posted on May 15, 2011 . Tagged with: digpen,, unconference,, digital, and peninsula. 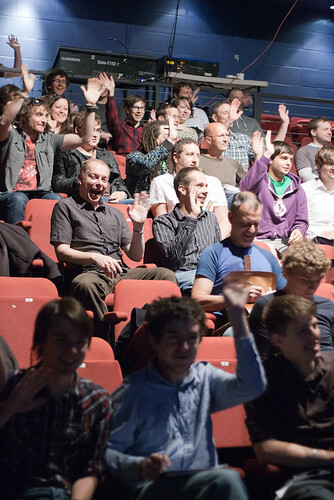 On Saturday, the second version of the Digital Peninsula Unconference was hosted in Exeter, at the Phoenix. After being volunteered to take some photographs, I spent much of the event running about taking them (that’s the flaw in having only a 50mm lens available to you). I’ve posted them on Flickr, but below are a few of the ones I liked best. The conference overall was pretty good, although it did feel like some of the people were pitching a little bit too much. Given the mostly technical community, it would be nice to hear more about the decisions made behind projects - stuff that’s useful to all. 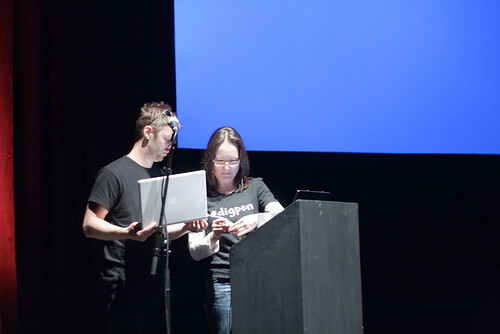 A little bit of on stage tech support. You can see the rest of the images here on Flickr. All of these were shot on a Canon 400D, with a 50mm lens. They were shot at ISO1600. It was quite a dark room, so many of the shots taken didn’t work out too well. In other news, if someone wants me to build something for them, I could probably get a better lens.